We offer every type of paper and weight in Glossy or Matte finishes including Metallic, Pearle and Star Luster Paper Stocks as well as Plastic, Vintage Kraft Paper, Black Paper, Bamboo, Sparkle, Silk, Cork, Wood and Thick Trifecta Sandwich, Heavy Linen, Velvet Laminated, Suede, Waterproof Stocks, 3D & 4D Lenticular, & more (such as Beef Jerky: Ask and You Shall Receive...). We have many finishes to choose from as well as Special Die Cutting, Laser Engraving, Laser Cutting, Spot Varnish, Colored Foils, Holographic Foils, Raised Lettering, De-Bossing and Embossing, Braille Cards, Round Corner, Punched, Fold-Over Cards, Tear Outs, Finishing for PVC Cards and more. Sit back. Relax. We got it! We offer Trifecta Triple Layered Business Cards, Postcards, Club Flyers, Collector Cards, Rack Cards and Bookmarks that make a Statement! With Trifecta, you can make triple the impact than with any ordinary paper in the market. Thick, durable and most of all stylish with various colors to choose from, it's the obvious choice when you want to get noticed and turn a few heads. We have the answer: Direct Marketing Packages. Our packages provide you with design, print and mailing services, with all the work completed in house. If you have your own design, great! We will quote you on your needs to best target your potential clients at an affordable cost! Simply call us at 262.997.4815 for a free marketing consultation, and we will help you generate ideas on gaining new customers, improving existing promotions, and exploring effective promotional methods to get customers in your door. If you currently mail postcards for your business and target your customers by a geographic area then this mailing program by USPS is for you. EDDM (Every Door Direct Mail) is a promotion that has been rolled out by the US Postal Service that enables regular retail businesses to mail at an astounding 17.7 cents per postcard without even needing to have a mailing address or postal permit. Paper Options: 14pt gloss coated cover with UV(C2S) / 14pt premium uncoated cover / 16pt dull cover with matte finish / recycled 100lb dull cover with matte finish. Increase your store's foot traffic with A-Frame Signs. Additional Signs and Stocks: Corrugated Plastic, Poly Bag, Poster Board, Magnetic, Metal, Spinner, Union, Yard Word, Foam Core, PVC Rigid Plastic, Coroplast, Styrene, Aluminum, Aluminum Sign Panels and 3D Window Signs. Our custom printed flags and fabric banners are the perfect solution for business looking to draw in more customers, promote an event or as a general promotional and branding tool. With award winning full color printing these vibrant flags move in the wind to grab the viewers’ attention. Printed flags and fabric banners are extremely versatile, waterproof, durable and easy to transport and can be used indoors or outdoors. 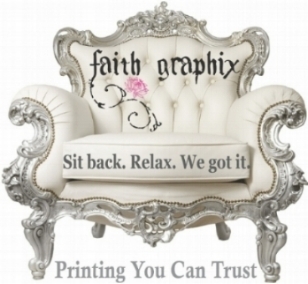 Faith Graphic Printing You Can Trust is your single source for innovative, quality trade show display products, portable exhibits, indoor and outdoor booths. Truss Booths, Hook and Loop Exhibit Stands, Trade Show Displays with Stretch Fabric or Vinyl Graphics, Pop Up Booths, Folding Panel Displays, Curved or Flat Display Booths, EZ Tube Displays. Build the best exhibit booth with trade show displays from Faith Graphix. We're your one-stop shop for exhibit booths, banners, table covers, supplies and giveaways to get you noticed! Build better business relationships by remembering your clients'/employees’ birthday, thank people for referrals or employees for their service, recognize clients’/employee’s life events and celebrate the holidays in custom style. Use pre-built templates ready for you to customize with your slogan, logo, photos or mission statements. 100% Eco Friendly. Recruit every customer that leaves your store to spread the word about your business in a style that brands your companies image with elegance or simple charm. Turn your custom bags and boxes into moving Billboards!